YNS Blog Hop - Alert!! For My Valentine and an Announcement! Tilda's furry four legged friend! My card today is another Rusty Pickles image and also comes with some news from Michelle, the owner of Rusty Pickles. Things have not worked out the way she had hoped so she has decided to make the Rusty Pickles images free (date to be announced). 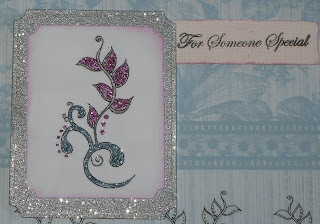 I have used the beautiful Flourish Leaves in my card from Rusty Pickles Digital Delights Shop. 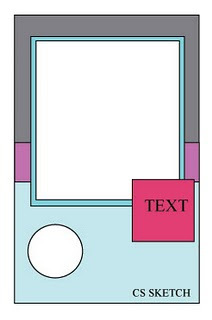 I have used the sketch at Crafty Sentiments which is shown below. I have adjusted it slightly but you can still see the sketch there - I hope!!! I have glittered the image with pink, white and blue and then shaded the edge with pink chalk. The larger nestability is from glitter card - I do like a bit of bling!!!! The background paper is one of Summer Driggs kits called Happiness - they are gorgeous and free but please send her a donation. I did some smaller versions of the image and flipped them to make a border at the bottom and I really like the effect - what do you think? The flower was made from Core'dinations Whitewash cardstock sanded down and then I added a bead - I bought it from a local Haberdashery - isn't it amazing what you can find - over 100 beads for 69p! Please check out my team mate Dawns creation at Cards For every Occasion. Practical Scrappers - Die cuts. Well there you have it guys, thanks fo rstopping by and don't forget to check out the post below - it has my favourite new stamp. Gorgeous card hun, love the way you have used the image across the bottom! Love that chalking effect around the edge - you must have picked up that little trick from someone pretty clever eh???? This is so gorgeous, love the soft colours of the papers, and the image is really elegant. Oh, congrats on the win over at Jude's (crafts international) - I am green with envy! so beautiful and elegant!! Love it!! Very pretty card, I like the sparkle. Thank you for playing with us this week at Practical Scrappers. Hope you're good. Luvin' this one. Nice card, those papers are gorgeous!! You did a super duper job on your "Sneak" Peak I am sorry things have worked out the way that they have!!!! You are so worthy of DT work and I am glad that you are taking Tracy up on her offer over at Sugar Creek Hallow!!! Gorgeous creation I love that you added glitter to so much of your card what kind of stuff do you use to add all of your glitter it always looks totally awesome!!! Lovely card! Thanks for playing at Practical Scrappers! i foung your wee blog via the Rak and just ahd to tell you how much i love your creations! They are just stunning, your very talented indeed! Beautiful card Ali, love all the sparkle! This is fab, love the papers and the image is lovely thanks for joining is at CS this week. This is a very cute card!! Thanks for sharing it. What a beautiful card. The detail is fabulous and I love the glitter. Thanks for joining us at Crafty Sentiments this week. Great Job playing along with all of us at Crafty Sentiments! You did a wonderful job! Beautiful card and so pretty. Thanks for joining us at Totally Papercrafts. This really is so pretty Ali and your pink flower is delish! Oooops, sorry Ali.... the previous comment was from me but I was signed into Google on my daughter's account by accident.... sorry! Love the image and the 'flipping bit' was a really good idea!! Beautiful card! I love the glitter frame. Thanks for joining Colour Create this week! I love this card! This is gorgeous. Love all the sparkle and beautiful details. Love the bling too!! I like how you used the same image along the bottom of your card, really creative. Just gorgeous! Such a pretty card! Those sweet pastels make me ready for spring to get here! Thanks for playing at Practical Scrappers!